You ever go to buy a car and the paint looks too good for the year of the vehicle? There’s just something about the motor that doesn’t look quite right. How about a brand new shiny alternator in a dirty engine compartment. 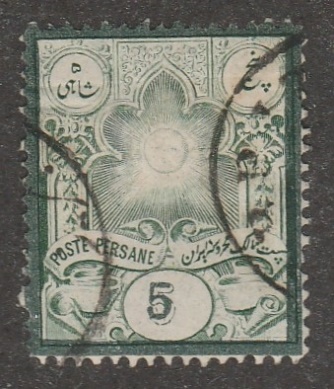 Let’s look at an example of that on an Iran stamp. Scott# 70, with surcharge, seen below, seems to have this ‘alternator’ problem; seen quite often in the Ebay seller’s marketplace. Below is a Scott #70, from an Ebay seller that wants $56.00 dollars plus shipping for his ‘Pinto wagon’. My wife wants a Pinto wagon, buy I’m not buying her this one, that’s for sure. 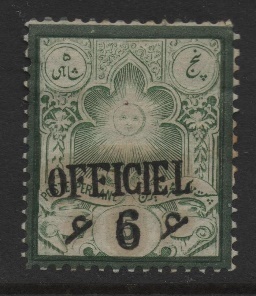 Fake Scott# 70 Ebay stamp. Step 1-Don’t even look at the surcharge. Yes they are fun to collect and show off at stamp club, but start with the foundation-stamp first. Step 2-Is the stamp real? 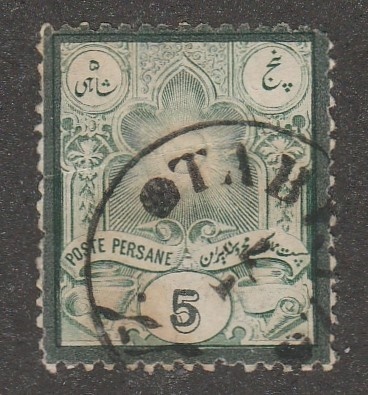 Note: On these years, 1887 stamps, the area around the numeral value is white as seen above. So we must rely on the right inner frame line. Step 3-If it is a fake, as this one is, STOP. Step 4-A fake is a fake is a fake. You can’t’ make lemon aid out of this lemon. 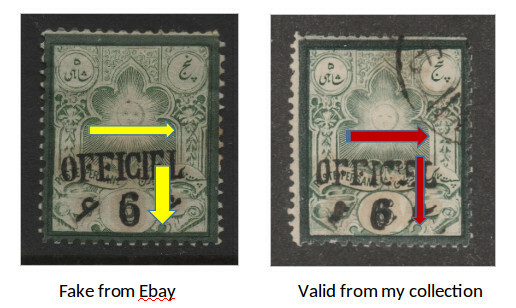 Step 5-Discard the stamp, put it in your fake reference collection and move on. This check works on all of the stamps of this era. The 5c, 10c and 25c also. See Fakes #3 for more info if needed. Starting at the top red arrow-on the right if a solid frame line=fake. Next arrow doesn’t apply here different year and make of stamp. I used Scott# 53, type 1, 1882-1884, stamps from my collection to show the foundation of the fake stamp we are discussing. All three of these stamps are valid stamps. Notice the right inner frame line on all three of these stamp-all are ‘soft’. No solid frame line seen. So what? I thought we were talking about a Pinto wagon my wife wants, right? If you were to buy this fake stamp for $56.00 plus shipping, you wouldn’t have any money left over for gas. My guess at the value of our fake ‘pinto’/Scott# 70 is right about a buck. The red arrows are showing the correct markings on a valid stamp. So with the $56.00 dollars I saved by not buying this ‘Pinto wagon’, I’m sure my wife would like to go to the movies instead. Someday I’ll get her a Pinto, but just not this one. It has a fake alternator. NOTE: I have offered the knowledge on the stamp. The surcharge is a whole separate area of study. I typically go with valid stamp, then study the surcharge. 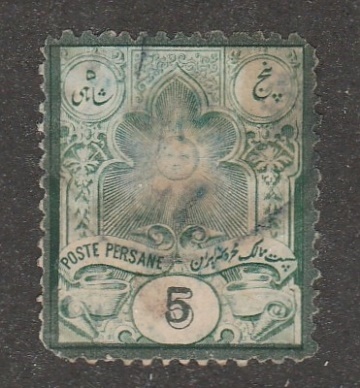 And please, please, If there is no post mark, on Iran/Persia stamps, full gum-early 1880’s—get it checked out before you buy it. Trust me. 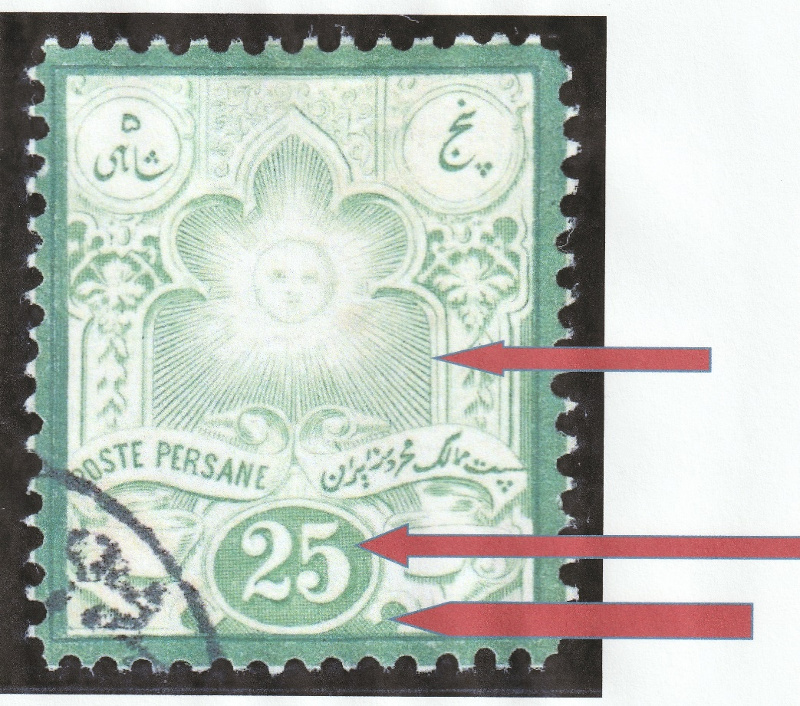 Again, all the credit and knowledge comes from the Iran Classic philatelic Reference by M. Sadri. www.persi.com has the reference guide for sale if interested.